Bring style and class to any bereavement ceremony with a beautiful oversized casket from Fast Caskets. We lend a hand during the difficult time of preparing for a funeral with our custom, elegant caskets. Our caskets can be delivered anywhere in the country within 24-48 hours. Our wide selection of caskets for sale online includes a vast collection of larger caskets. When you are needing something oversized, try our Sandstone Casket. This casket comes in a lovely champagne finish and has a luxurious rosetan crepe interior. 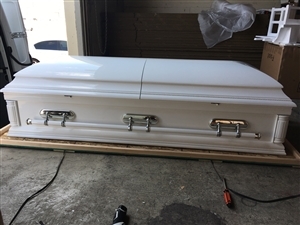 The casket is durable and spacious at 31 inches wide. 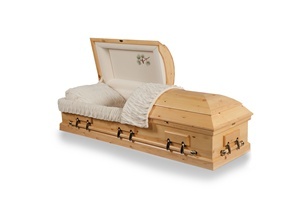 For a more natural look, try our Rocky Mountain Pine Oversized Casket. This gorgeous casket has a knotty, pine wood finish and can hold up to 210 pounds. Please note—our oversized caskets require a larger vault and burial plot. Take a look through our collection and feel free to contact Fast Caskets if you have any questions.